…That is the question. A couple of poignant articles in recent weeks reveal a significant weakness in the battle to reduce global food waste – the problem of inadequate cooperation between nations. In a Wall Street Journal piece entitled “Who Bulldozed My Cheese: Russia Destroys Tons of Banned Foods From West in Smuggling Crackdown,” Thomas Grove reported on the destruction of large amounts of foreign-made cheese by the Russian government. A Russian government spokesperson noted that the cheese in question had likely been produced by one of the European countries that had imposed sanctions on Russia in the wake of its annexation of Crimea last year. In response to those sanctions, Russian President Putin imposed a retaliatory ban on U.S. and European foodstuffs. Those restrictions were apparently heightened at the end of July, with officials threatening to discard even more food (such as Spanish ham and Polish apples) into landfills (a condition we see far too often even without retaliatory strikes between countries). Grove reported that despite some calls for the food to be distributed to the poor, Russia’s Agricultural Minister apparently played the safety card – stating that if his nation couldn’t guarantee the safety of such (blacklisted) food, it could not be distributed to the Russian people. Grove noted that 28 metric tons of apples and tomatoes from Poland as well as 40 metric tons of apricots had been destroyed to date. The associated picture of a bulldozer plowing vast amounts of food into the ground is all too familiar – indicative of the one to two billion tons of food that goes to waste across the globe annually according to the Institute of Mechanical Engineers. Much of this food, of course, ends up contributing to global warming through methane gas emissions as it decomposes, to say nothing of the opportunity cost of the inputs that went into producing it. A mere two weeks later, Paul Sonne followed with an article describing the “zest” with which Soviet inspectors were destroying embargoed Western food items. In the wake of the orders to destroy food from countries that had imposed sanctions on Russia, government officials have apparently been inspired to go to heightened levels to document (and publicize) such destruction through videos – and some of those videos have received a considerable numbers of on-line views. Sonne first describes the formality of a video in which a small quantity of calamari (93 lbs.) was destroyed. Since then, he noted that officials across the country seem to be competing against one another to impress higher level government officials of their “food destruction zeal” by posting videos of destruction events on-line and inviting news crews to observe the process. 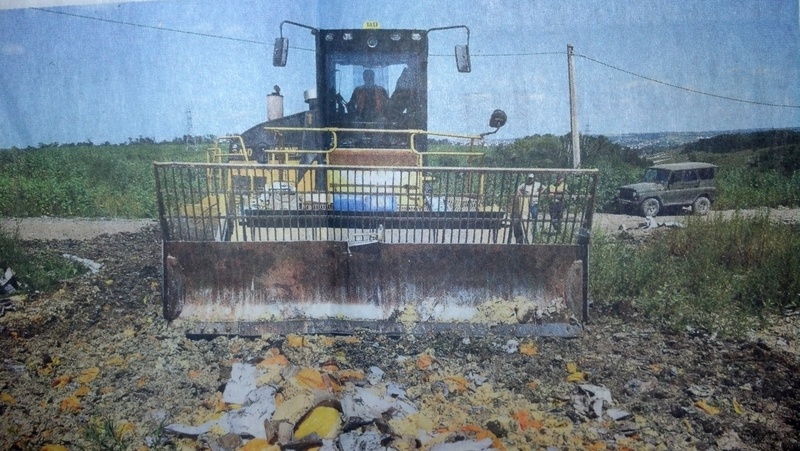 As a result, Sonne notes that multiple videos have emerged, including scenes of workers in hazmat suits shoveling food into a hole, workers unloading nectarines into a landfill during a thunderstorm, a video documenting the journey of nearly 40 metric tons of produce taken to a dump, and a video of a “show trial” of three frozen Hungarian geese that were then bulldozed into the ground. Disturbingly, Sonne reported that hundreds of tons of food have been destroyed following the mandatory destruction orders, with Russian agricultural officials reporting that 900 metric tons of food products (550 plant-based, and 321 animal-based) had been seized for destruction since Putin’s orders were issued. Clearly, such destruction involves a great deal of high-quality calories that could have been put to good use – especially for the hungry. Sonne noted that while many Russians apparently support the ban as a way to “strike back” at Western sanctions, others who grew up in the Soviet-era and recall food conservation efforts are shocked at the waste. This, of course, is a frequently cited theme under the umbrella topic of food waste. Those in developed Western countries are blessed with an abundance of food – and that culture of abundance leads us to waste billions of pounds of food annually. On the other hand, those who grew up in the War years recall a frugal culture in which wasting food was not an option. We are in need of a return to that mindset. It strikes me that the seemingly competitive desire on the part of Russian officials to “out-do” one another with regard to enforcing and documenting the destruction of food – and in some cases making light of the process – is exactly counter to the type of mindset that we need regarding the waste of excess food across the globe. We also need to question the message that we are sending through such videos. Rather than reveling in efforts to destroy immense quantities of perfectly good food, we want all manner of global citizens (and especially individuals in positions of authority) to be thinking of how excess food can be put to the highest value use – especially involving feeding those in need. In short, we need global recognition of the value of excess food as a resource. At a minimum, our creative efforts, our motivation, our “zeal” for achieving objectives, should be directed toward diverting such excess food to alternative uses along EPA’s food recovery hierarchy rather than bulldozing it into the ground. The zest and zeal to out-do one another in destroying food resources is incredibly misguided. We need exactly the opposite – individuals working earnestly to out-do one another to put excess food to the best possible use. Doing so starts with awareness and education of the global food waste problem, but also requires collaboration among nations – not retaliation that leads to such senseless waste. We’re seeing a situation in which destruction of perfectly good food is being minimized – in some cases with humor – when in fact we should be rallying against such behavior. It is time for a reframe. Retaliatory behavior among nations won’t enable us to successfully feed 9 billion global citizens by 2050; only collaboration will. We have a long way to go in the effort to feed 9 billion by 2050. We still have close to one billion global citizens that are hungry. Moreover, as reported this past week, southern Africa is again facing extreme food shortages due to drought conditions. With so many experiencing hunger and nutrient deficiencies, we can’t afford to waste food, and we certainly can’t afford to glorify the destruction of hundreds of tons of food. When it comes to excess food, collaboration should be the key focus. Retaliation isn’t an option. Next Next post: Excellent Expo, Milan-Style!